While PEW and Gallop polls have claimed that Donald Trump’s ratings at the end of his 30-days in the White House dipped far lower than his predecessors Barack Obama, Bill Clinton and Dubya Bush – Trump received support for standing up to America’s corrupt Deep State from the most unexpected source – Iran’s former president Dr. Mahmoud Ahamdinejad. No world leader is in better position to understands the current anti-Trump smear campaign run by the Jewish Lobby and the mainstream media than Ahmadinejad who suffered a similar treatment during his eight-year presidency (2005-2013). Last year, former British diplomat in Tehran, Dr. Michael George Andrew Axworthy, claimed Donald Trump to be an American Ahmadinejad. Axworthy lived in Iran before the 1979 Revolution and has authored two books on Persian history. However, he carries a personal grudge against Ahmadinejad who refused to allow Axworthy visit Iran during his presidency due to his father’s links with CIA and Mossad. On February 26, Ahmadinejad wrote an Open Letter to the US president Donald Trump, who is declared Jewish Messiah by Israeli rabbis. The letter, according to Ahmadinejad, was not from an ex-president to a newly elected president – but from one humane to another humane. Ahmadinejad tells Trump that he agrees with his claim that United States is suffering from corrupt elites. He also told Trump Iran is one of the oldest civilizations that had enriched many foreign civilizations. He said Iran was proud to present to the world a great religious and political reformer who established a true democracy in Iran – Imam Khomeini (here, here). “A leader who depicted the love and kindness of divine prophets to all human beings, and was the flag-bearer of freedom, justice and brotherhood for all nations. A great reformer who, from a divine-humane perspective, was the helper for all the oppressed and was the harbinger of peace, friendship and justice, heralding fundamental reforms to benefit all nations,” Ahmadinejad wrote. I’m surprised Ahmadinejad is still expecting some humanity coming from American Zionist leaders who’re more loyal to Israel than America. Donald Trump like his predecessors works for the Deep State controlled by oligarchs (mostly Jewish), military industrial complex and 65-million-strong pro-Israel Zionist lobby groups. In order to understand American leaders and American racist culture, Ahmadinejad needs to learn from the two great sons on modern America – Malcolm X and Louis Farrakhan. In August 2016, Ahmadinejad wrote an open letter to then US president Barack Obama, accusing him of not living up to his 2008 campaign promise of CHANGE when it comes to the US-Iran relations. I like to conclude this posting by acknowledging an American law professor Liaquat Ali Khan (Washburn University), founder of the Legal Scholar Academy and author of several books on law, who like Ahmadinejad, also see some good things; Donald Trump is a Muslim!. 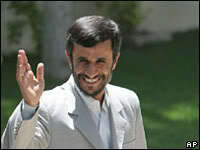 Ahmadinejad will be back to clean up Rouhani’s mess. He will indeed.